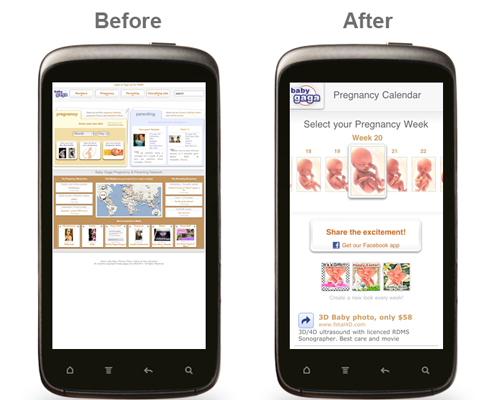 Inside AdSense: Is your site ready for your mobile users? Is your site ready for your mobile users? about the massive shift to mobile we’ve seen in your users over the past two years. Still, 4 out of 5 online publishers don’t have a mobile-optimized website, and they risk losing their fastest-growing audience. Today, we’re launching a new suite of tools at howtogomo.com to help publishers build mobile-friendly websites. To help demonstrate the potential of creating a mobile-friendly site, we’d like to share the story of AdSense publisher Baby Gaga. Two weeks after launching their mobile-friendly website they saw a 64% increase in mobile visits. This leading destination for educational materials and social support for pregnant women also saw an 82% increase in mobile page views and a 50% increase in revenue from mobile (full case study). Today Baby Gaga’s mobile users don’t need to squint and they view more pages per visit. See how you rate. Use the GoMoMeter to analyze your site’s mobile user experience. Start planning. Download the GoMo Publisher Guide for mobile best practices. Find a partner. Learn about vendors who can help with implementation. As mobile continues to take off, we believe it's important for publishers to develop a strong mobile strategy now and make the most of this new opportunity. Baby Gaga’s decision to go mobile allowed them to improve the user experience for their mobile visitors and also make more money. We want to help you do the same. In the coming weeks, we’ll be releasing additional materials to assist you in this process, so stay tuned to Inside AdSense for further announcements! Last December, we posted about the massive shift to mobile we’ve seen in your users over the past two years. Still, 4 out of 5 online publishers don’t have a mobile-optimized website, and they risk losing their fastest-growing audience. Today, we’re launching a new suite of tools at howtogomo.com to help publishers build mobile-friendly websites.